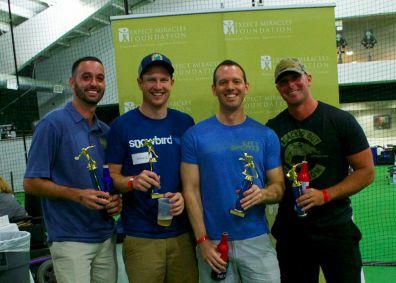 Over 120 young professionals joined together on August 25, 2016 for the 2nd Annual Expect Miracles Kan Jam Classic at the Boston Athletic Club. Twenty teams committed to this year’s fundraising goals for cancer research and the Expect Miracles Foundation college scholarship, awarded annually to a student who has been affected by cancer. Thanks to the efforts of all of our teams, sponsors, and guests who came to support the event, this year’s Kan Jam Tournament raised over $17,000! This is over a 30% increase in fundraising from the inaugural tournament in 2015. Special thank you to our T-Shirt Sponsors: Bowdoin Group, Eastern Bank, Robert Half, and Sapient Global Markets. Event attendees had the opportunity to play in the Kan Jam competition, or cheer from the sidelines and experience the variety of additional activities thanks to our many generous event partners. Guests listened to live music, played the spectator games provided by Social Boston Sports, including corn hole and giant jenga. Guests enjoyed Essentia water and the variety of options of beer in the beer garden sponsored by Anheuser-Busch, and savored food from local restaurants including Bon Me, Sal’s Pizza, Barlow’s, Pastoral, and Anna’s Taqueria. Guests also had the chance to win some fantastic prizes such as a day trip to Martha’s Vineyard, dinner at the Palm, scuba diving lessons, a year of free bread from Panera Bread, and more! Congratulations to all of our night’s winners! Congratulations to our top Kan Jam teams, as well, who walked away from the night with something better than food and free swag – bragging rights and trophies! This year, the honor of Kan Jam Classic Champion went to Particular Set of Skills Against Cancer closely followed by Chinnea Lames - Kan Jam Warriors Against Cancer - Featuring JZ - Team #2 in second place, and The Slotness Monsters in third place. Thank you to all of our teams who worked so hard to fundraise and made this year’s Kan Jam Classic fun and competitive! As always, special thank you to our amazing volunteers who donated their night to help support Expect Miracles Foundation and the fight against cancer. We couldn’t do it without you! Thank you to State Street and One Brick Boston for securing the majority of our volunteers. This year has been full of some amazing events and fundraising efforts hosted by YPEM, and Expect Miracles Foundation is so grateful to all of the generous companies and individuals who support us throughout the year. The Chartered Alternative Investment Analyst (CAIA) Association is the world leader in alternative investment education. The CAIA Association is known for the CAIA Charter. Earning the CAIA Charter is the gateway to becoming a member of the CAIA Association, a global network of 8,400 AI leaders. CAIA also offers the Fundamentals of Alternative Investments Certificate Program®. For more information, please visit CAIA.org.